This will be my third and final Guinness recipe for St. Patrick’s Day 2018 and the most fun yet. 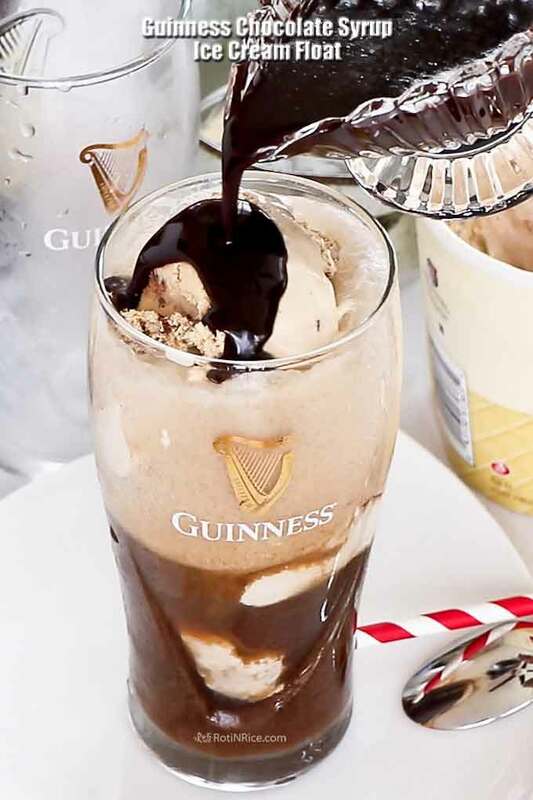 A dessert is always fun and this Guinness Chocolate Syrup Ice Cream Float is that and more. Dark malty stout, chocolate, and (in this case) coffee ice cream make this ice cream float so, so yummy! It is frothy, chocolatey, and creamy. You have to give it a try! I am not big on desserts but it is nice to have something sweet to round off a special meal during the holidays or the weekends. Of course this weekend is St. Patrick’s Day weekend, hence the Irish themed dinner with two types of corned beef – Roasted Corned Beef and Cabbage and Guinness Brown Sugar Glazed Corned Beef and Colcannon (Irish Mashed Potatoes and Cabbage. I prepared two types of corned beef for comparison purposes and also so that we will have leftovers for Corned Beef Hash later in the week. It is all good because we love corned beef and I only make it once a year. So, after a meat heavy dinner it was fun to have a “lighter” dessert and this Guinness Chocolate Syrup Ice Cream Float worked out well. Apart from the Guinness Chocolate Syrup which I prepared ahead of time, there really wasn’t much to do except to chill the glasses. This was my first time tasting a Guinness Ice Cream float and I have to say, I really liked it. It was YUMMY! 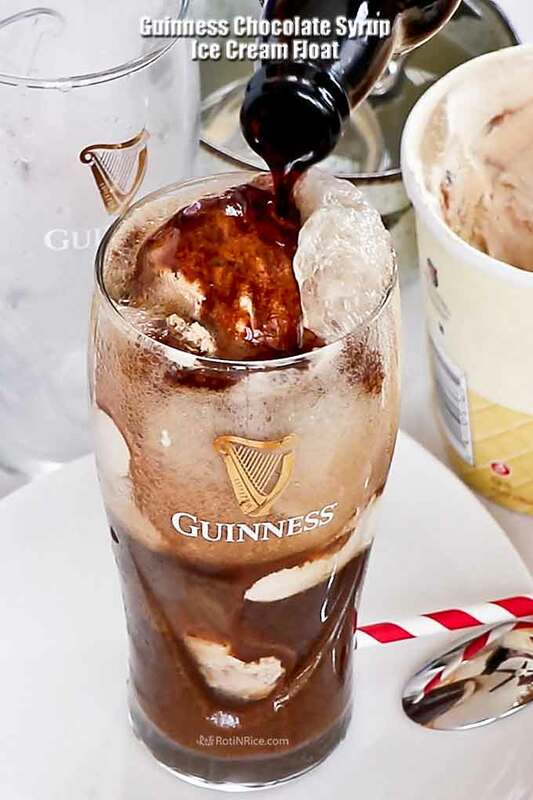 This ice cream float was special because of the rich Guinness Chocolate Syrup made with Guinness stout, brown sugar, ground cloves, and semi sweet chocolate chips. This dark syrup is not only great on ice cream but also on waffles and pancakes. 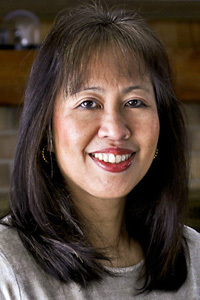 It is also very easy to prepare and only takes about 17 minutes to cook it down to a syrupy consistency. It is definitely worth a try! 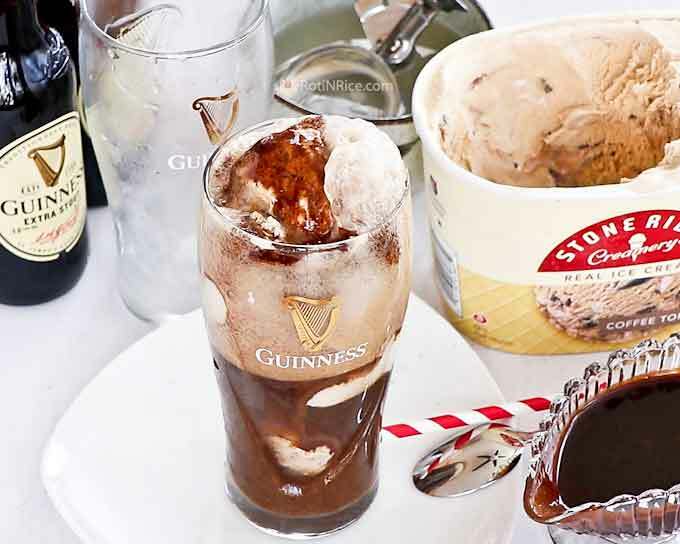 Round off an Irish themed dinner with this delicious Guinness Chocolate Syrup Ice Cream Float. Guinness stout, chocolate, and ice cream make this dessert so yummy! Combine Guinness stout, brown sugar, and ground cloves in a small saucepan. Stir and bring it to a boil over medium low heat. Watch it carefully as it boils over easily at this stage. Once it settles down, let it simmer for 5 minutes. Add semi sweet chocolate chips and whisk to combine. Continue to boil until mixtures becomes thick and syrupy, another 10 minutes. Remove and allow syrup to cool completely before transferring to container. Place 2 scoops of ice cream into a tall glass. Slowly pour root beer over the ice cream. It will start to foam and may overflow. When it has settled slightly, top with another scoop of ice cream. 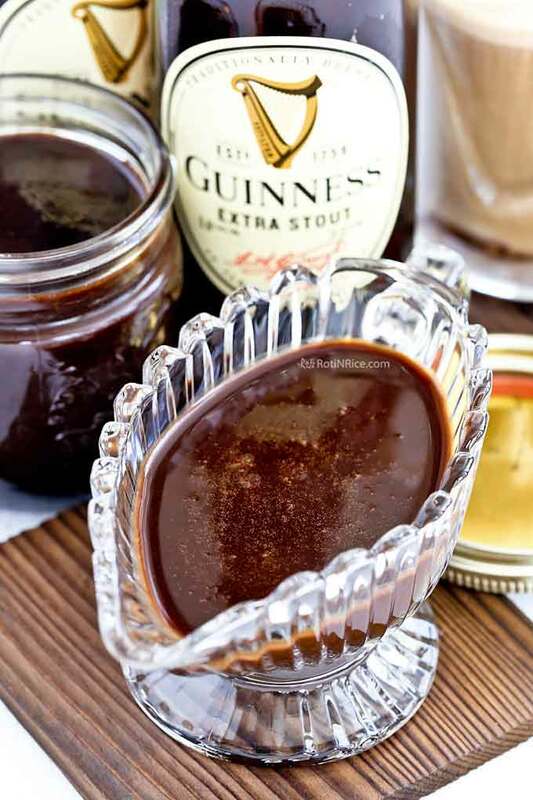 Drizzle some Guinness Chocolate Syrup over the scoop of ice cream. Serve immediately with a straw and long dessert spoon.